The only Paris attacks suspect still at large has been arrested in Brussels. Mohamed Abrini is believed to have played a major role in the November massacre that killed 130 and the Brussels bombings in which 32 people died last month. He has been on Europe’s most wanted list since being identified on CCTV video in a car, with recently arrested ISIS logistics chief Salah Abdeslam, two days before the Paris atrocities. But Belgian federal police spokesman today confirmed that Abrini ‘was in police custody’. The 31-year-old was described on his international arrest warrant four months ago as ‘dangerous and probably armed’. The Belgian of Moroccan origin is also thought to have travelled to the UK last year, visiting Birmingham. He took photographs of an unidentified football stadium while his Islamic State cell began planning the attacks in France, according to intelligence source. Abrini was a childhood friend of Salah Abdeslam, another Paris attacker caught last month in Brussels and currently awaiting extradition to France. Their families used to be next-door neighbours in the notorious Brussels suburb of Molenbeek. 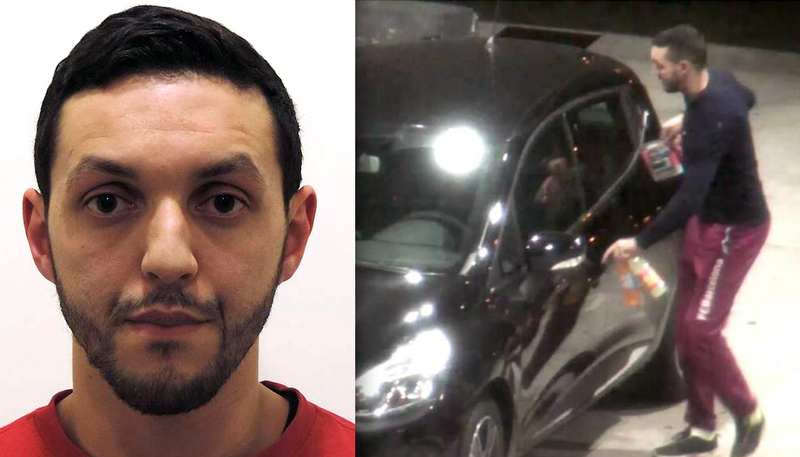 Abrini travelled by car with Salah Abdeslam and his brother Brahim – who blew himself up during the Paris attacks – on November 10 last year. The trio made two round trips between Brussels and Paris to rent hideouts for the Paris attackers. Abrini then travelled to Paris with the convoy of gunmen and bombers. In the days before the attacks, he was spotted on CCTV footage at a service station in northern France, buying soft drinks in the company of Abdeslam and at the wheel of the rented black Clio that was later used in the attacks. He disappeared the day before the gunmen and suicide-bombers attacked the French capital. It is thought that he may have coordinated the attacks from a distance – his relatives have said he was in Brussels on the night of the attacks. Abrini is thought to have given up training as a welder aged 18 and begun gravitating towards extremists. He was known to police for thefts and drug-related offences. In 2014, his younger brother Souleymane, 20, died in Syria while fighting in an Islamist militia headed by Abdelhamid Abaaoud, the on the ground ringleader of the Paris attacks who was killed by police in November. As well as Birmingham, in the year before the Paris attacks, Abrini had travelled to Istanbul and perhaps Syria, as well as UK, Germany and Morocco.